Labdanum essential oil has a wonderfully soothing, deep fragrance, useful in treating people after shock or trauma has been experienced. Labdanum essential oil, also known as Cistus oil, is of great benefit when included in a lymph massage blend, also when applied to the shoulders and neck to drain swollen lymph nodes in the neck and for menstrual aches and pains and stomach cramps. Rock Rose essential oil (Labdanum) has been known since ancient times to give a sense of warmth and comfort and to be good for the soul. Labdanum has been used in salves and ointments since the middle ages. The gum was used to treat catarrh, dysentry and to encourage the menses. Much confusion ranges regarding the oil extracted from cistus ladaniferus. It seems to have many names: labdanum, rock rose, cistus and rose of sharon. Labdanum essential oil is sometimes called Rock Rose, which is sometimes thought to be the floral extraction of Helianthemum canadense – which is very costly. 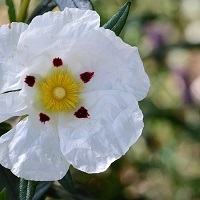 Cistus can also refer to the steam distillation of the leaves and twigs of cistus ladaniferus or to the oil produced from the leaves and flowers, sometimes through the enfleurage process, which would make the oil very expensive.